This set of Polymer Engineering Multiple Choice Questions & Answers (MCQs) focuses on “Poly(vinyl Chloride)”. 1. At what temperature does acetylene reacts with dry hydrogen chloride in a multi tubular reactor packed with mercuric chloride catalyst, supported over activated carbon, to produce vinyl chloride? Explanation: The acetylene and dry hydrogen chloride mixture is added to the multi tubular reactor, temperature of which is maintained at 90-100 ᵒC. The reactor bed packed with mercuric chloride catalyst is supported over by activated carbon support. 2. Which of the following reaction does not give HCl as a byproduct? In the rest other reactions after cracking of ethylene di-chloride, HCl is removed as a byproduct of the reaction. 3. Which of the following grades of poly vinyl chloride is unsuitable for insulation purposes? Explanation: The emulsion grade of PVC contains some traces of soap or detergent and other ionic components, which makes it unsuitable to be used in insulation industry. 4. What approx. percentage of chlorine is present in the homopolymer of vinyl chloride? Explanation: The homopolymer of vinyl chloride contains nearly 57% chlorine. By increasing the chlorine content in PVC, its heat deflection temperature can be increased. 5. Which of the following solvent cannot solubilize Poly vinyl chloride into it? Explanation: Poly vinyl chloride is insoluble in all hydrocarbon solvents. Therefore, it is insoluble in hexane solvent. On the other hand, PVC is soluble in cyclohexanone, tetrahydrofuran and nitrobenzene. 6. Which of the following property is enhanced when vinyl chloride is copolymerized with 10-20% diethyl fumarate? Explanation: Copolymer of vinyl chloride and 10-20% diethyl fumarate has come up with enhanced wokability and toughness, while maintaining the higher softening temperature. 7. Which among the following comonomer can make the copolymer of vinyl chloride suitable for phonograph records? Explanation: The copolymer of vinyl chloride and about 13% vinyl acetate is used for phonograph records, due to its low softening temperature and high solubility, better color and clarity. 8. Which of the following compounds can process the flexibility applications of PVC? Explanation: The proper use of plasticizers in poly vinyl chloride can produce flexible items and can process the flexibility applications of PVC. Some of the plasticizers are high boiling phthalates and phosphate plasticizers. 9. 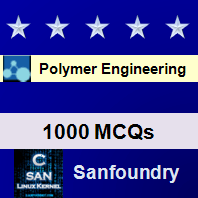 Which of the following compound is used in fire retardant compounds of PVC? Explanation: Tricresyl phosphate is a phosphate plasticizer, which is used in the fire retardant compounds. Chlorinated paraffin and phosphate plasticizers are basically used for this purpose. 10. Which of the following monomer pairs forms a copolymer that exhibits excellent chemical resistance and self-extinguishing properties? Explanation: Copolymer of 15% vinyl chloride and 85% vinylidene chloride, known as Saran in the trade, has excellent chemical inertness including resistance to acids and alkalies and prominent self-extinguishing properties.